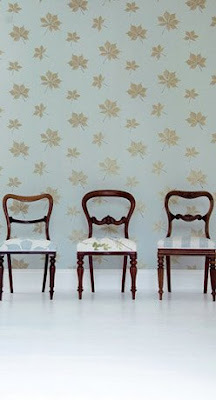 The wallpaper here is Amaranta from Harlequin but I chose this image to keep because of the styling and the chairs which I love. While photo walls look like they are easy to copy or achieve - like most things there is a bit of a difference I feel between good and great. 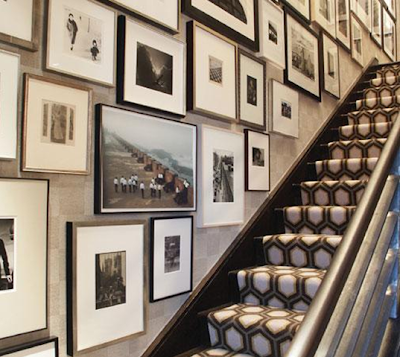 This is a stunning array of frames, mounts and photos. I also like the subtle squares in the wallpaper. Obviously not a house where anyone runs their hands along the walls though . . .
Claire Stening is a Brisbane based artist and as a fan of still life I really like her work. I love art in a kitchen - pictures of fish, fruit, cutlery (Claire has some lovely paintings of spoons in her portfolio) and so on. This lemons are fantastic and would give a great splash of colour but I also really like her work in more muted colours like the fish and bone handled carving set below. You can see lots more of her work at www.clairestening,com and www.edwinacorlette.com. Playing with scale in interiors is interesting and can produce fabulous results. 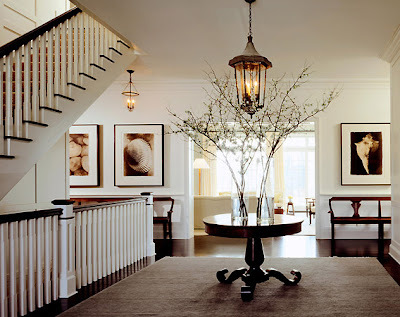 Too often we go out looking for an artwork that is the 'right' size for a space when, like in the picture below, you can achieve a great look with something oversized or unusually shaped. Its a hard thing to get right but I think it works here because the top lines up with the line of the beam and the bottom and the green cabinet are close to the line of the white panelling. 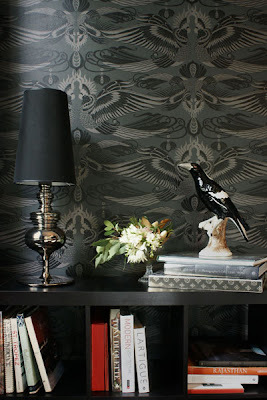 This is 'Cockatoo' another of Catherine Martin's designs for Porters Paints. 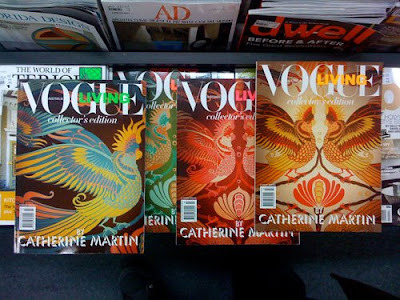 This design was used in four different colourways on the cover of the last but one issue of Vogue Living. It is hard to see in these photos but you can see on the mag covers below that there is phenomenal detail in the design. From a distance the effect is fantastic, almost stately and you would hardly know there were birds involved at all. 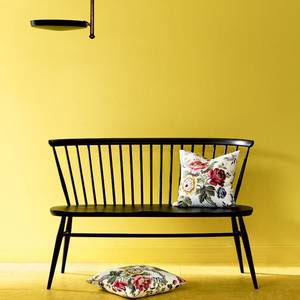 The weather in Sydney today is indescribably grey and really wet so to cheer myself up I am posting this sunny yellow shot of the Ercol classic the Love Seat. I am not sure what that thing is hanging from the roof but I have loaded the pic now and am not going to go back and crop it . . I think I have quite classic taste at heart as I am always drawn to images like this which some people may find overly traditional. 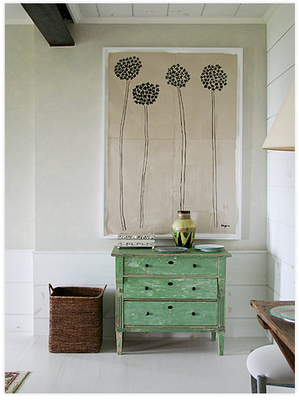 This is the hallway in a home featured by Design Sponge. Liz Demos, the homeowner has a vintage shop in Savannah, Georgia. I love the shiny wood and the curve of the bow fronted hall stand. 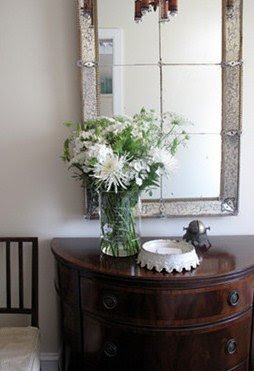 The mirror and the little chair add their own detail to an otherwise very simple hallway - which is how I like hallways to be - uncluttered and welcoming. Or should I say doona day (Australian for duvet). 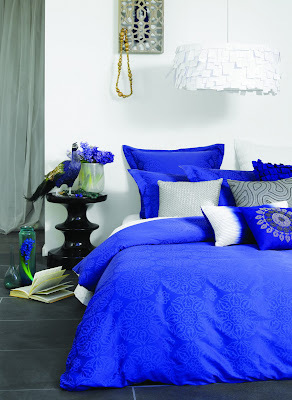 These inviting piles of cushions and quilts are from the Aura Lifestyle range. 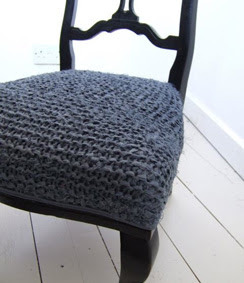 The black and cream is very grown up and sophisticated but I am also very taken by the new 'chilli' colourway. Great for boys and girls alike. Now the blue at the bottom which is also new is not for the faint hearted but I love ultramarine and the pattern on the quilt cover is pretty. Is it an egg ? This kitchen is from James Tse's portfolio. 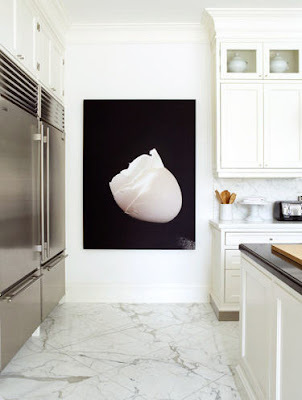 I am a fan of art on the walls in the kitchen and this one is a beauty. What do you think - photo or painting, poached egg, egg shells, flower or something else ?? Either way I love the drama of the marble floor and the artwork. Jim Franco's photographs were posted by the Deco Detective a week or so ago and I had to pluck out this one. 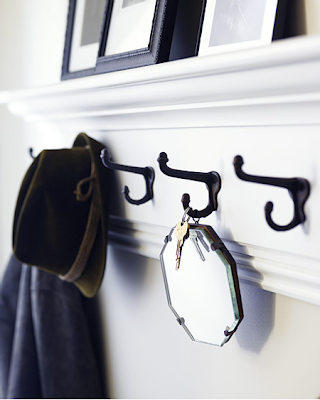 Love the idea that a coat rack can also serve as a picture rail and love the little mirror which is an idea I am going to copy as soon as I can find a similar little gem to hang on my hooks in my back hallway. It is a personal goal of mine to get better at checking my appearance before heading out the door (I don't always remember and then look at myself in horror as I pass a shop window). I'm thinking a little mirror like this is just the ticket. I wrote about Armchair some time ago here. As their stock is unique and constantly changing I drop in online from time to time to check out the new chairs. 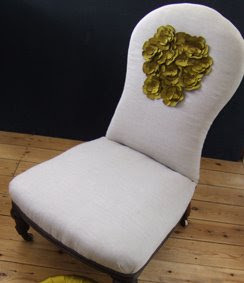 Pip Robb has a great eye for a stylish chair and high impact fabric choices. 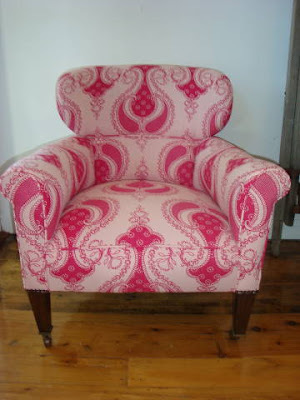 This is the Vicki chair which I absolutely love. 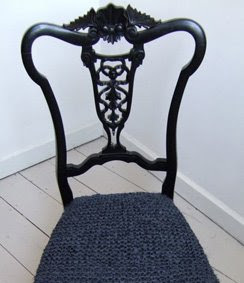 Look at how the curves of the chair are repeated in the fabric pattern and how beautifully the upholsterer has placed the fabric. I could keep on going on stairs and landings from my stock of shots in the good old Folder of Ideas but I promise I will stop here for now. 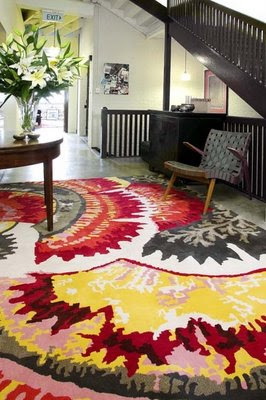 This rug is 'Cosmic Garden' designed by Easton Pearson for Designer Rugs - doesn't it just look fantastic with the dark wood ? I really enjoy browsing through Nathan Egan's portfolio. Admittedly the New York based design duo (one half of which is Fiona Egan from Dublin ) work within some amazing properties, catering as they do for the high end of town, but there is a grounded nature to their choices which makes their spaces inviting and liveable in which can sometimes get lost in super luxe design. 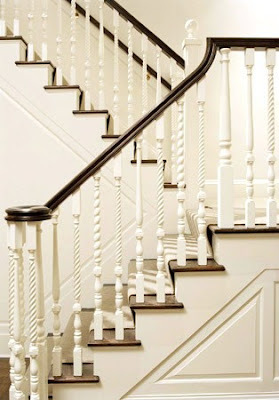 These are just a selection of halls and landings that caught my eye. There is a lot more to take in on their website. This little vanity was tucked away at the back of Vogue Living - the recent issue edited by Catherine Martin with the fabulous CM cover. It is from Spain, a company called Sonia and the range is called Atic. 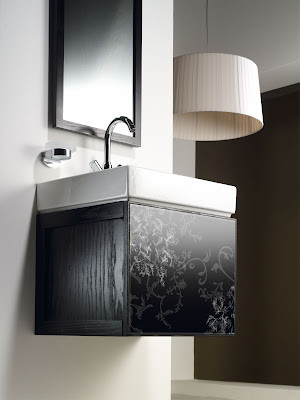 Its a neat piece, pretty small, about 500 mm wide so perfect for that small bathroom where you want everything off the floor to maximise the feeling of space. Available from Reece in Australia. Regular readers will know that, like a lot of Irish women, I am a bit of an Orla Kiely fan. Two things to share - one is this new (? 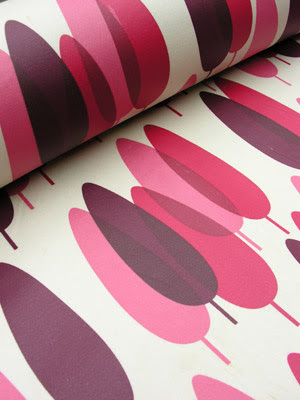 ), well new to me anyway, oilcloth pattern called Poplar Trees which seems to be selling out fast at Tinsmiths. The other is to advise anyone within striking distance of west London that the Orla Kiely sample sale is on next week from Thursday to Sunday. I haven't been to the sample sale recently having left London three years ago but it was great the last time I went along. I have posted about Aiveen Daly before here. 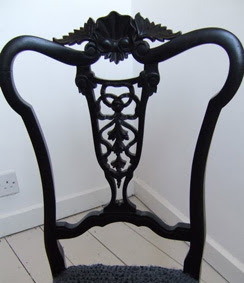 She has a section on her website where she showcases one-off vintage pieces that she reupholsters in her unique way, so I swing by from time to time to have a look. See my current picks below. 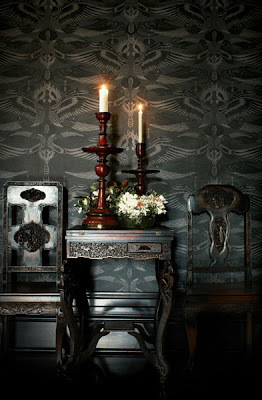 Just love the mix of textures, lacquer and knit, linen and silk. 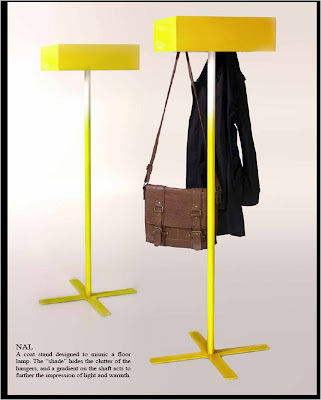 This is the NAL or 'not a lamp' coat stand from Vaugh Shannon a Dublin based design duo. Clarity, functionality and wit in the design of their products is the core aim according to their homepage. The top photo is the more recent shot and I prefer the cross base to the round one below. I have had the bottom image for a while but had saved it as a Vaughn Shannon design and when I went looking for their site couldn't find it and thought, to my dismay, that the credit crunch had got them. But no, just a typo on my part. 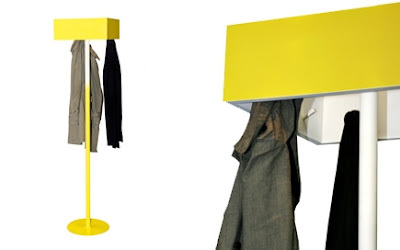 I am quite a tidy person and the NAL appeals because the hidden hooks make the coat rack appear so much neater and streamlined. Great for a smaller space in my view.